You have a pink wallet. You have a pink handphone. You have a pink laptop. You have a pink wallpaper on your laptop. You have a pink bed. You have a pink chair. You just ate a pink jelly. You are wearing pink contact lens. You dyed your hair pink. You are munching on pink strawberry biscuits. You are looking at ice-angel's Pink blog. What else about you isn't pink? No matter what colour it is now, be it white, black, red, or whatever, throw it away. 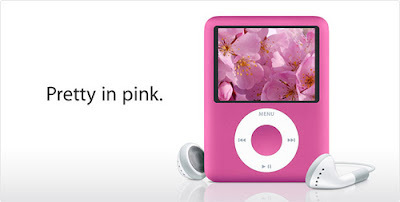 Welcome a new addition with opened arms, the PINK IPOD NANO! Isn't pink such a pleasant colour to look at? Everyone needs a portable music player now. And no one would stick with 1GB. You wouldn’t want to hear the same songs over and over again everyday! Get the 8GB pink ipod nano, im sure you’ll look forward to mrt and bus rides everyday just as an excuse to show off your beautiful pink gadget! Now, you’ve found something to spend your Chinese New Year hongbaos with! As for males, get this for your lovely girlfriend for valentines day (which is coming VERY SOON), and smile in glee while your girlfriend gush over you for at least a month! Im sure you all know where that is, if you are a frequent shopper at cineleisure!